First things first, at CVS you will need a CVS card, CVS cashiers have them in store. This is how you will get Extra Care Bucks, CVS coupons, beauty bucks and track your yearly savings. 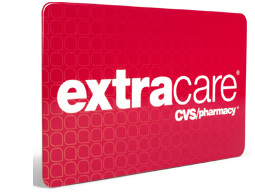 Their rewards system is Extra Care Bucks aka ECB’s which is like CVS cash and can be used on most everything at CVS (some exclusions apply). CVS does not have a limit to how many coupons can be used per household per day at the discretion of the store. Please note that Extra Care Bucks DO have limits. You can find the limits in the weekly ad or on any price tags in the store. At CVS you can also stack cvs coupons and manufacture coupons which is an excellent way to increase savings. CVS coupons can be found in a multiple of ways. You can attach your card to the CVS mobile app and send mobile app coupons straight to your card. CVS also sends out email coupons when you create a cvs.com account and link your card. CVS coupons also print out of the redbox machine which is also the price scanner, we all these coupons CRTs. And lastly you can print CVS coupons HERE (cvs.com/coupons). Percent off CVS coupons of any form cannot be combined with sale items. If you have an email CVS coupon for $4/$14 body wash and a CRT for $3/$12 body wash you can combine them, however, you will need need to hit the $26 threshold to use both. Net is $1 or $.25 each!! Limit 1 (this limit is solely for extra care bucks. Once you have done this deal and gotten your $4 extra care bucks the limit for your card will be reached). Another thing to note is Extra Care Bucks are always before coupons. You only have to hit the $12 threshold before any coupons to still receive the Extra Care Bucks. Yes, you can use Extra Care Bucks from a previous transaction and still receive Extra Care Bucks!